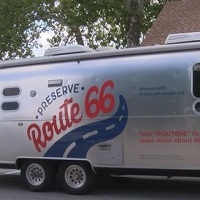 Representatives with the National Trust for Historic Preservation are traveling Route 66 in a classic Airstream trailer. They’re drumming up support to make the highway also known as the Main Street of America or the Mother Road a National Historic Trail. The organization’s Jason Clement told KOLR-TV the designation would bring more funding and recognition for the roadway.”We’re really hoping to preserve what makes Route 66 so special and the reason millions of people travel it every year, and that’s just this great roadside culture, and a really amazing snapshot of kind of Americana at its best,” Clement said. Route 66 travels across Missouri from St. Louis through Springfield and Joplin for 317 miles within its pathway from Chicago to Santa Monica, California. A bill to grant Route 66 a historic designation is in the U.S. House right now. Clement says he hopes the president signs the declaration before the end of the year.